Every once and a while, the STM makes a subtle change to its services, a modification no one will really notice or care about. 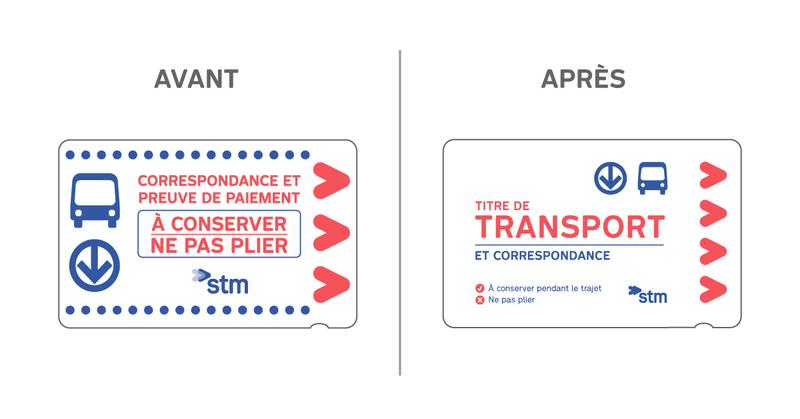 STM transit tickets have gotten a makeover, a redesign that means big things for Montrealers. No, the new tickets aren't equipped with some new technology or change riding the bus/metro in any way. The tickets just look different, but that's a big deal unto itself. STM transit tickets, used by so many in the city on a daily basis, are iconic. And in a city obsessed with art and aesthetic, you can bet people care when STM tickets are changed. Just look at this reddit post, which has already garnered over 50 comments, most of which have to do with people critiquing the new design. More minimalist with use of white space, the new tickets are definitely sleek. We'll miss the blue dots running along the horizontal edge of the tickets, but not that much. But will the new tickets make for amazing filter paper, just like the old ones? Honestly, we haven't gotten our hands on a new ticket yet, so we can't say for certain. Something tells us, however, that the STM knows what 60% (made up statistic) of its tickets are used for, so we expect the same level of quality filter-paper-material. And if you thought the previous ticket-design was clunky, get a load of this ticket all the way back from the days when there was a Montreal Street Railway Company.